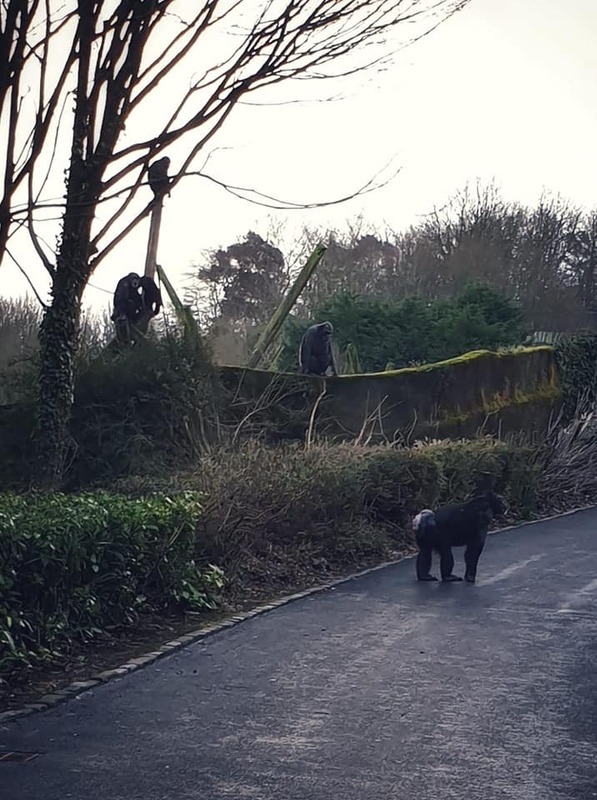 Chimpanzees at the Belfast Zoo took a downed branch as opportunity to make a great escape — sort of. Zoo visitors Danielle Monaghan and Dean McFaul filmed the incredible incident as one chimp after another used a fallen tree limb to hop up onto the exterior wall of the chimpanzee enclosure. The chimps actually carried the branch over to the wall and propped it up, Monaghan explained later. She said she was both fascinated and “absolutely petrified” by what they saw as the zoo was closing. “Don’t escape you bad little gorilla,” her daughter could be heard saying off camera in the video. The animals climbed up onto a wall, and then at least one briefly wandered along an pathway. The couple continued filming as the chimp went for a walk. “Stay there dude,” McFaul can be heard saying as the chimp stops to take a break. Zoo-goer Chantal Baxter also filmed part of the encounter. For a brief time the chimps were on the loose. While some visitors were frightened, the chimps actually didn’t bother anybody. “It’s fair to say we got our money’s worth,” Baxter told Belfast Live. Alyn Cairns, a zoo spokesperson, told the BBC storms weakened trees in and around the enclosure sending branches into the enclosure. The chimps went back into their exhibit themselves. “They’re intelligent primates and know they’re not supposed to be out of their enclosure, so got back in themselves,” he explained. The zoo will review the natural elements of the enclosure. Last month, one of the zoo’s red pandas made a dash for the outside world, but was quickly recaptured. So this latest incident spurred a few jokes.